This is one of our best-selling items on a recurring basis. 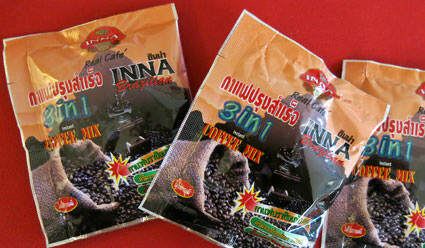 Once you've tried INNA brand 3-in-1 coffee (coffee, coconut-based non dairy creamer, sugar), you might be hooked. We just got a new shipment so it's fresh as can be, pleasantly surprised that INNA put an extra 3 packets in each bag, so now you get 33 servings instead of 30. $12.25 for 33 packages is about $0.37 per package. This is a lot less expensive than corporate brands (for example compare Starbucks at $15 for 16 packages of it's "Via" instant coffee, which is $0.93 each). We import this directly, so you end up getting a great coffee at this price. 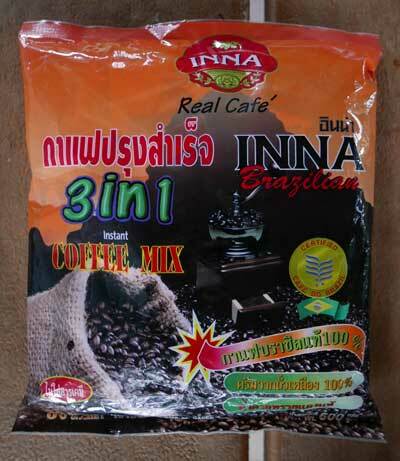 Made in Thailand, where 3-in-1 coffee is extremely popular, using Brazilian instant coffee. Add a packet to one cup of boiling hot water, stir and enjoy. You get a generous 30 packets (20 gm per packet) in an attractive master bag. Great coffee flavor. Ingredients: Brazilian instant coffee, brown sugar, non-dairy creamer (glucose syrup, soybean oil, sodium caseinate, sodium silicoaluminate as anti-caking agent). We also offer 3 in 1 Thai tea.